This article about seven seemingly unconnected inquisitions post mortem made at Chipping Sodbury between 1419 and 1422 started life as a piece of secondary research where the primary research was to find who owned the three adjunct places of Chipping Sodbury, Old Sodbury and Little Sodbury. The last place was where William Tyndale spent two years teaching the children of Sir John Walsh. One of the places called Sodbury was once owned by the family of Weyland (which family held land in medieval Ireland) and it was to find which Sodbury that this article had its origin. As the article took shape, the seven separate inquisitions began to make connections to each other, and in such way showed some of the connections among the landed gentry of Gloucestershire that formed not just in that county but carried itself across western England and into south Wales. The three places of Sodbury, i.e., Chipping Sodbury, Old Sodbury and Little Sodbury lie about the summit of a hill called Old Sodbury. Upon this hill is an old Roman fort from which the area takes its name. Sodbury lies some four miles east of Yate which latter place is ten miles north-east of Bristol. 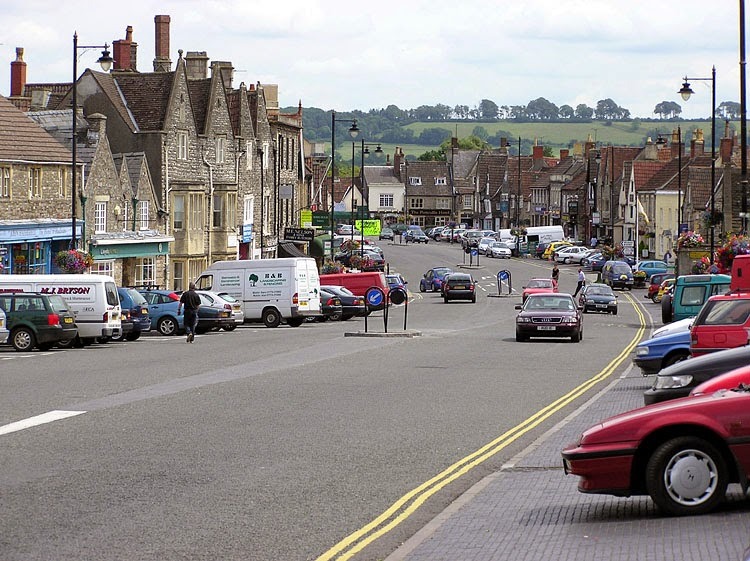 Chipping Sodbury is only about two miles from Little Sodbury yet its history is distinct from the latter place. Together with Old Sodbury, the area of Chipping Sodbury formed the large estate of Britric, Earl of Gloucester in the time of Edward the Confessor. Chipping Sodbury was a new town, built on a virgin site, in the time of Henry III; one of only two such new towns built in Gloucestershire. The name of Chipping Sodbury translates as ‘market place of Sodbury’ and the market was here established in the time of Henry III. The founder of Chipping Sodbury was William Crassus who married a sister of William Marshal. William Crassus had five sons the eldest two of which were named William Craasus the elder and William Crassus the younger. It was William Crassus the elder who got the charter for the market at Sodbury in 1217 and in 1224 was seneschal of Leinster in Ireland for his uncle, William Marshal. The first inquisition post-mortem was held at Chipping Sodbury on 9th November 1419 into the property held by the late John Deverose (Devereux) in Gloucestershire. It found he held the manor of Oldland of the king in chief and two other portions of land there of the Earl of Stafford and the Abbot of Keynesham. John Devereux died on 25th September 1419 and was succeeded by his daughter Joan, wife of John Chesebrok. John Devereux also held a manor in Dorset for life by an inquisition held at Sherborne on the same day. In 1385 Cecilia, daughter and heir (since the death of her brother John in 1349) of William de la More granted half the manor of Bitton called Oldland to Sir John Devereux of Staundon and Joan is wife. Cecilia de la More was married to Nicholas de Berkeley of Dursley who died without issue in 1382. The connections of business and friendship between the Gloucestershire gentry appear in the life of Sir John Devereux. In November 1407 Sir John Devereux appeared as a witness to a land deed concerning property in Bitton. Sir Gilbert Denys was also a witness to this same deed and his inquisition post mortem at Chipping Sodbury appears at the end of this article. On 30th October 1419 an inquisition post mortem was held at Chipping Sodbury into the property of the late Sir William Gamage. Sir William Gamage died on 27th September 1419 and was succeeded by his son Thomas Gamage who was about fifteen years old. The inquisition found that William Gamage held the whole, or part of, seven different properties in Wales in what are now Glamorganshire and Monmouthshire. One of these places, West End in Caldicot, was acquired by William’s father, Gilbert Gamage in 1381 by grant of King Richard II. The then occupant, Sir John de Sapy, had a grant of the manor for life but was forced to surrender this to Gilbert Gamage. But the inquisition post mortem of 30th October 1419 was not thorough enough. A second inquisition was held at Tewkesbury on 9th October 1420 which found as in the previous inquisition but with the addition of land at Newcastle in the march which was held of the Earl of Worcester. But these two inquisitions did not tell the full story and so a third inquisition into the property of Sir William Gamage was held on 18th September 1421 at Chipping Sodbury. This inquisition increased the value of Rogeat from 100s to 200s and stated that William died on 23rd August 1419. The inquisition was found that since the death of Sir William that his two landlords, the Earls of Worcester and of March had both entered into their respective properties and were taking the profits while Gamage’s heir was still a minor. The proof of age of Thomas Gamage, son of William Gamage, taken on 10th January 1430 stated that Thomas Gamage was born at Rogiet and was baptised at Rogiet church. It also said that Gilbert Gamage was the father of William Gamage and grandfather of Thomas Gamage. In 1397 William Gamage, esquire, was in the army of Roger Mortimer in Ireland and in July 1397 was given licence to remain in Ireland for one year. Roger Mortimer was then Lieutenant of Ireland and had first sailed to Ireland in September 1394 in the company of King Richard II. It is possible that William Gamage also went at that time. Roger Mortimer remained in Ireland after Richard left. Roger Mortimer was in England at the start of 1397 and returned to Ireland after July 1397 with William Gamage. In a battle with the O’Byrnes at Kellistown near Carlow on 20th July 1398 Roger Mortimer was killed and the vast Mortimer estate fell to the king as Mortimer’s heir was only seven years old. It is not known when William Gamage returned to England. In 1412 a business of war connection was made between William Gamage and Sir Gilbert Denys (his inquisition post mortem appears below). The two men assembled an armed force (described as “no moderate multitude of armed men”) and went to the castle of Coity (Glamorganshire) in Wales where they proceeded to besiege the castle. Their purpose was to expel Joan, wife of the late Richard Vernon. On 16th September 1412 King Henry IV commissioned William Newport and five other men to assemble a force and “quietly” go to Coity and raise the siege. William Newport was to cause nobody to lay siege upon Coity and any claimant were to seek redress through the courts. It is not clear if William Newport was able to raise the siege but he was unsuccessful in the long run as William Gamage held the castle of Coity and two thirds of the manor at the time of his death in 1419. On 24th January 1421 an inquisition post mortem was held at Chipping Sodbury into the property of Margaret, wife of Sir John Blaket who survived her. Margaret Blaket had died on 8th August 1420. The inquisition found she held the manor of Didmarten for life, worth 4 marks, and that it was held in reversion to John, son and heir of William Worston and the said John Worston was her son by her first husband. Margaret Blaket also held various properties in Somerset of different landlords by inquisitions held in that county. Margaret Blaket also had a son by John Blaket called Edmund Blaket. Sir John Blaket died on 24th June 1430 leaving Edmund Blaket as his son and heir without any property in Gloucestershire. Edmund Blaket was then about eighteen years old. On 12th August 1420 John Bowelers, esquire, died and on 20th May 1421 an inquisition post mortem was held at Chipping Sodbury into his property. It found he held land at Magor of the king but in right of his late wife, Joan. Two further properties were also held the Earl Marshal in right of the late Joan Bowelers. John Bowelers had three further properties in Wales from the Earl of March. John Bowelers was succeeded by his son Ralph Bowelers who was about fourteen years old. Following the death of John Bowelers and during the minority of Ralph Bowelers, the King took the issues of Magor while the Earl Marshal took the issues of Penhow and Portskewett. Edmund, Earl of March took the issues of Whitson, Rogerstone and Redcastle and after his death, his wife, Countess Anne took the issues. The proof of age of Ralph Bowelers was taken on 13th November 1429 at Gloucester. It said that Ralph was born at Penhow in the March of Wales and was baptised in Penhow church. One of the witnesses, John Sweyn, was married on the day of Ralph’s baptism in Rogiet church where Thomas Gamage was baptised. On 14th February 1422 an inquisition post mortem at Chipping Sodbury found that the late widow, Isabel de la Mare (died 17th September), held one third of the manor of Westbury on Severn for life. The manor was previously granted to Isabel and her then husband, Richard de la Mare, along with three other men by John Mellebourne, son of Peter Mellebourne. On the death of Isabel the three remaining leasers granted the manor to John Mellebourne and his wife, Elizabeth. One of these three other men was John Merbury of Herefordshire. The various connections of friendship and business surround the people associated with Isabel de la Mare. In August 1420 Richard de la Mare and John Mellebourne appear as witnesses to a deed whereby John Merbury granted the manor of Talgarth in Wales to three trustees. In January 1413 John’s wife Agnes, Lady of Weobley, attended the baptism of John Barre (kinsman of Isabel de la Mare) as his godmother. Lady Agnes rode to Rotherwas church with two male servants, John de Eye and William de Huntyton. These two men were witnesses to the proof of age of John Barre in 1433. Lady Agnes Merbury died on 3rd February 1436 leaving various lands in Lincolnshire, Herefordshire, Bedfordshire, Shropshire, Nottinghamshire and Leicestershire. We are old that Walter Devereux as her kin and heir. This Walter Devereux was the son of Walter Devereux, son of Agnes by her first marriage. In August 1429 John Merbury and Lady Agnes along with four others, including John Devereux, granted Talgarth to James de Berkeley, lord of Berkeley. It is presumed that this John Devereux was a relation of Lady Agnes by her first marriage. It is as yet too speculative to say if this John Devereux was any relation of the John Devereux who was the subject of the inquisition post mortem at Chipping Sodbury in November 1419 noted above. Isabel de le Mare was previously married to Sir John Eynesford of Tillington and John Barre, son of Sir Thomas Barre junior, was her kinsman and next heir. This John Bare was about eight years old in 1422. The proof of age of John Barre, son of Sir Thomas Barre junior, son of Thomas Barre senior, was made on 1st May 1435 at Hereford. The proof said that John Barre was born at Rotherwas on 31st January 1413 and was baptised in the local church of St. Mary by the Bishop of Hereford (by the prior of Hereford said another witness). Isabel de la Mare also held various properties in Herefordshire where William Bourghull was her next heir. Many of these Herefordshire properties were from her first husband, Sir John Eynesford and reverted on her death to John Mellebourne and his wife, Elizabeth. When John Milbourne, esquire, died on 12th September 1436 he was seized of various lands in Lincolnshire, Herefordshire and Westbury on Severn in Gloucestershire (he also held Bollow manor by a separate land deed). John Milbourne was survived by his wife Elizabeth and their year old son, Simon Milbourne. On 30th April 1422 an inquisition into the property of Cecily, widow of Henry Thorp, esquire, was held at Chipping Sodbury. Her husband, Henry Thorp, had died on 11th October 1416 leaving land in Devon, Wiltshire and Oldbury in Gloucestershire. Thomas Thorp was his son and heir and was aged about seventeen years. Thomas Thorp failed to come into his inheritance as on 5th October 1419 he died leaving Agnes his wife as a widow and his inheritance to his younger brother, Ralph Thorp. Agnes Thorp didn’t long survive her husband as she died on 27th November 1419 leaving her brother William Bonham as heir. Cecily Thorp was left to take the profits of the family estate during the minority of Thomas Thorp and after. On 20th March 1422 Thomas’s mother, Cecily Thorp, died thus leaving a son, Ralph Thorp as her heir and that of her late son. Ralph Thorp was twenty years old on 11th November 1421. Cecily Thorp held the manor of Oldbury on the Hill for life. On her death, her executors were to use the revenues of the manor to pay her debts and the debts of her late husband whose executor she was. If anything was left it should go to Ralph Thorp but the executors still held it at the time of the inquisition post mortem. Cecily Thorp also held lands in Devon and Wiltshire which were formerly held by her husband, Henry Thorp. It was later found that the inquisitions taken in Wiltshire concerning Cecily’s estates were incomplete. On 10th April 1423 another inquisition was made which exposed lands at Newton Toney and Allington. The proof of age of Ralph Thorp was taken on 15th May 1423 in which we are told he was born and baptised at Oldbury on the Hill. Ralph Thorp married a girl called Philippa and they had a son called John born about 1432. Philippa Thorp died before her husband and Ralph Thorp married again to a girl called Alice. On 3rd October 1446 Ralph Thorp died. The inquisition post mortem taken at Gloucester on 4th May 1447 said that Joan, the wife of John Burdon, was Ralph’s great-grandmother and that Joan was held the manor of Oldbury on the Hill. Joan Burdon granted the manor to trustees who in turn re-granted it to John Burdon and Joan. After John Burdon died, Joan granted Oldbury to Thomas de Berkeley, lord of Berkeley and eight other people to hold of their heirs. On 25th March 1447 the heirs granted Oldbury to Edmund Hungerford. Apart from the grant of Oldbury to Thomas de Berkeley, there seems to be no obvious connection between Cecily Thorp and the other six inquisitions post mortem taken at Chipping Sodbury between 1419 and 1422. The last inquisition post mortem of 1419-1422 was that taken for Sir Gilbert Denys. On 25th June 1422 the inquisition post mortem was held at Chipping Sodbury. Sir Gilbert Denys had died on 24th March 1422 leaving Maurice Denys as his son and heir. This Maurice Denys was fourteen years old. Sir Gilbert Denys held the manors of Alveston and Earthcott of the king. Sir Gilbert Denys also held the manor and advowson of Olveston with his wife, Margaret Denys, who survived him. Olveston was to revert to Sir Gilbert’s kinsman, Nicholas Denys for life and then to the right heirs of Sir Gilbert. Sir Gilbert Denys was an important figure in the estate economy of fifteenth century Gloucestershire and beyond. As noted above he went to Coity Castle in Wales with William Gamage in 1412 with an armed force to lay siege to the place and evict a widow. In December 1390 Sir Gilbert Denys was first witness to the grant by William FitzWarin to Thomas de Berkeley, lord of Berkeley of land at Wixstowe in the hundred of Berkeley. In June 1417 Sir Gilbert and six others became trustees to the estates of Thomas de Berkeley, lord of Berkeley, in Gloucestershire, London, Somerset and Wiltshire. Sir Gilbert Denys’ son, Maurice Denys, continued the family association with the Berkeley family of Berkeley Castle. In 1466 he was witness to the grant in trust of Berkeley Castle by Thomas Stanley to various members of the Stanley and Berkeley families. Maurice Denys was witness to a later Berkeley deed in 1474 and was party with Maurice Berkeley to receive in 1450 the manor of Little Marshfield in Gloucestershire. The apparent unconnected families who had inquisitions post mortem made at Chipping Sodbury appear connected in other documents. In October 1463 Maurice Denys, esquire, was witness along with Sir John Barre (kinsman of Isabel de la Mare as noted above) to a grant of land in Clopton by James Berkeley to his son Thomas Berkeley. This article began life as a piece of secondary research on who owned which of the three adjunct places of Chipping Sodbury, Old Sodbury and Little Sodbury. It was hoped that soe of the seven inquisitions post mortem made at Chipping Sodbury between 1419 and 1422 may provide some information on ownership. But the seven inquisitions provided no such help. Instead they have taken on a life of their own by showing connections of family and business between some of them and connections with pace such as Rogiet for Gamage and Bowelers. Thus this article ends with seven, seemingly unconnected, inquisitions post mortem, having a nice few links of family, friendship, business and place connections.